New Zealand's South Island may be just as rural as the North, but it still seems to be where the action -- and most of the eccentricity -- is. There's an art deco festival in one city; a wine festival in another (and vineyards throughout), and yet another has a busker's festival celebrating the art of street performing, and its very own wizard who comes out of hiding every day at 1 p.m. to rant on whatever topic pleases him. Even the ferry baggage-handlers have a waggish sense of humor. 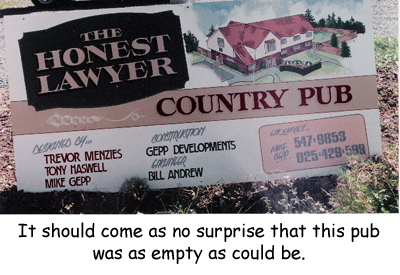 I learned about their brand of fun the hard way, after one of them changed the combination lock on my backpack during the five-hour ride from Wellington to Picton. Apparently, the bored worker somehow realized that I closed the rotating number-style lock by turning all the numbers at the same time without bothering to scramble them. He turned the tumblers a few times, unlocked it, then reset it from 753 to 531. I discovered the change the next day when I tried to get something out of the side pocket of my backpack and couldn’t open the lock. As a result, I had to try every combination from 000 to 999 to find the right set of numbers. I never made that mistake again. Maybe the wine gives the locals their strange sense of humor. Some gourmets say the South Island's wines may be one of its best-kept secrets. Other people told me there's a reason no one in the United States has ever heard of the country's wines: they’re not all that good. I'm not sure who’s right, but it did seem odd that a country that had never been known for its love of fine dining, has been beating French wines in international taste-tests. It's especially strange where blandness in food seems to be a virtue and meat pies seem to be the national dish. After all, every restaurant in the country serves the food we in the states refer to as "pot pies." There's even a chain of fast-food meat pie restaurants in some cities. I don't have anything against meat pies, mind you. Although my friends who have been to Scotland, England, Australia, and New Zealand turn their noses up at these little morsels, I love them because they were an inexpensive staple of my diet during the day as the Magic Bus went from town-to-town, stopping at just about every dairy bar along the way for meals, snacks, and souvenirs. They may not be haute cuisine, but they were one of the few routinely inexpensive items on menus in a country where everything cost far more than I expected. Granted, the exchange rate may have been in my favor, but that doesn't mean the prices were cheaper. In fact, prices may even be a bit more expensive because of the cost of shipping items to the islands and trucking them over winding two-lane roads that hug the sides of hills throughout the country. Sensing a story, I stepped off Magic in Nelson to talk to local vintners. (This is the trouble with being a journalist -- even when I'm on vacation, I'm still on the job.) As it turns out, there was a reason New Zealand's wines hadn't found their way into the U.S. Most of the country's wineries were micro-vintners and their output was so low it wouldn't be enough to supply the thirsty U.S. market, industry experts told me. My sources also said most of what was available had been snapped up by the British. Since most of the people I wanted to interview were out of town, I ended up with a lot of spare time, but not much cash. So I went for what turned out to be a drive on the weird side: The Wombat Tour. It may not have fit the standard definition of adventure travel because it didn’t involve bungee jumping or white water rafting, but it was an adventure of another kind. An adventure in embarrassment and a test to see how much humiliation can take. Fortunately, my threshold for embarrassment is high. Wombat Bob gave it his best shot, however. Bob had nothing against me or the other two riders on the bus, both of whom were Japanese. He was just a big bear of a man who loved to have fun and was making the best of a bad situation. He had been the local distributor for Foster's Beer and had been so successful that he increased the company's sales in his coverage area by 60%. As a result, Foster's wanted him to pick up the additional 40% the following year so that sales in his territory would have increased a total of 100% in two years. Unfortunately, he had a few bad months, his year tanked and he got fired. During his time with Foster's he starred in a series of crazy commercials featuring a character called Wombat, after Bob's hometown in Australia. When the ads caught on, he became known as Wombat Bob. 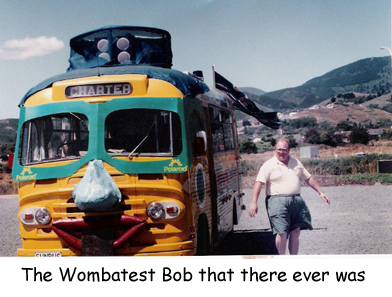 Bob capitalized on his success by buying a school bus and decorating the front of it with green sunglasses, a blue nose, red lips and a brown Astroturf tongue. The contraption then became part of a rowdy annual fundraising caravan sponsored by the Variety Club. His vehicle fit right in with the rest of the crowd in the caravan because all were festooned with colors you'd never find on any self-respecting school bus including such odd add-ons as ears, eyes and noses, and loud stereo systems. The whole point of this odd amalgamation of buses and their collective semi-drunken traveling road show was to raise money and distribute it to children's hospitals along the way. After the firing, he scrambled for a way to keep his family fed, and thought about the bus. 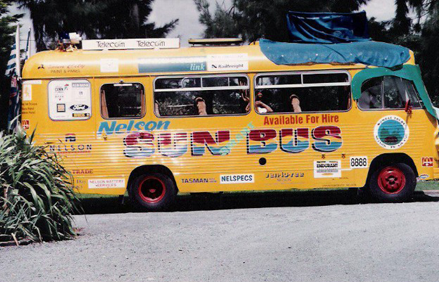 He launched the Wombat Tour a few weeks before I hopped on the bus, and was still trying to figure out what to charge passengers. Looking back, it occurs to me he probably couldn't have paid most people to get on the bus, because most tourists like to fool themselves into thinking they can blend in with their surroundings. Bob's bus was the vehicular equivalent of wearing Madras shorts and a short-sleeved Hawaiian shirt in a modest Moslem country. There are plenty of reasons: the brown Astro-turf tongue, the loud music blaring from the speakers, the sirens, and Bob's penchant for making rude comments to people he knew as he drove past. "Put that woman down, you're a married man," he said over the bus's public address system as he drove past a friend who was standing by a camper at a local campground. "The man with the camera is a secret agent," he announced at another stop as I tried to take a few candid shots of street scenes. As the bus rolled down the street with music blaring, sirens shrieking, and bells ringing, it drew amazed stares from stunned motorists, received admiring glances and friendly waves from children and stopped traffic where ever it went as drivers scrambled to get out of the way of what they thought was an emergency vehicle -- only to discover they had pulled over for the Wombat Bus. Some were not amused. "You do get some interesting looks as you go down the street," I told Bob. "They're not looking at me, they're looking at you, mate," he shot back. When we stopped at a farm to pick strawberries, he told the owner I was "a world famous strawberry hunter," then left me to cope with the response. "Where's your gun?" I heard her mumble under her breath as I walked past. In short, the whole bus was gaudy and tacky and the experience wan’t just embarrassing, it was humiliating. Which may explain why I enjoyed it so much. After the tour was over, Bob invited me home for dinner. It was easy to see why he had to scramble to make a living. He has a nice house, two sons, a daughter, and a mother-in-law who had just moved in after being released from the hospital. Despite potentially tough times, everyone seemed to be taking it all pretty well, sniping at each other as good-naturedly as many families do. Then they heard me laughing and proceeded to rain good-natured abuse down upon my head, making me feel like one of the family.